After my sixth laparoscopy for endometriosis, this time a hysterectomy to remove the adenomyosis and cyst-filled cervix, I was meant to go on a 4-5 week endometriosis rehabilitation course. The schedule for this endometriosis rehab is a packed one – from 7am until 6pm you would run from appointment to appointment, Monday through to Saturday. I was really looking forward to going, but unfortunately, the health insurers decided that I didn’t need it. Instead, they recommended that I see a local psychotherapist, specializing in infertility and/or psychosomatic causes of pain. No idea why, because the lab results report I still have endometriosis after the operation, and I explained I really don’t want kids. They also gave me a list of ‘pain specialists’, but most of them were orthopedic doctors. Pelvic soft tissue problems are not joint problems! After a day of being crazily upset, and knowing these decisions here can’t be questioned, I set about building my own ‘rehab course’ with local doctors and therapists. There are long waiting times, I will have to pay for a lot without insurance coverage, and it won’t be intensive, but I think I can cover most of the content of the endometriosis rehabilitation course. Psychotherapy – PTSD counseling is more important and urgent for me, help for living with chronic pain would also be useful as I’ve never had psychological ‘treatment’ for that. Unfortunately, there’s a 6-7 month wait, and no English speaking doctor specializes in either of these areas. Anesthesiology – This is a good choice for looking at my pain medications (my current low-dose codeine/paracetamol does not cover, so I just take nothing and not move around). I’ve found a specialist who also deals with fibromyalgia. They also offer electro-therapy, physiotherapy and massage. But it’s a 4 month wait. Water aerobics – Joined a class in a warm water pool – there are only two warm pools in Leipzig. 2 month wait for the next class to start. Gymnastik – This is the movement-oriented physiotherapy. Ideally, it would have been in the warm pool, but they have no openings for 6+ months. So, same facility, but on land – probably better for back/pelvis exercises anyway. Gathering forms, hopefully not a lot wait. Physiotherapy – I already go once a week to keep my C2 neck/headache spinal problem in check. I think this will be bumped up to twice a week. This is more manual therapy than physiotherapy – a mixture of massage and stretching, no exercises. Dietition – the health insurer offers ‘dietary classes’, but no one in this city knows anything specific about endometriosis. I’ll have to research this more online. It’s hard sifting out the nonsense from science-based information. A day or two to spend in PubMed. Relaxation – Easy to do at home. I already meditate once a day as it helps with pain and do progressive relaxation as I fall asleep. Increasing meditation to twice a day and starting tai chi. Balneotherapy – This is another easy one to do at home – baths with epsom salts or other good stuff. I think I’ll skip the mud baths though – too much cleaning up! Gynecologist – I’ve optimised my endometriosis medications already, and don’t want to do a fourth course of Zoladex/Lupron any time soon, so my gynecologist doesn’t have much to do. Urologist – may need to be added to my rehab team, if the bladder pain from the hysterectomy doesn’t go away (it has gotten less in the last month). Bowel specialist – And I should search for a bowel doctor, to look (again) into the cyclical bowel bleeding, that can only be endometriosis, even though it couldn’t be seen in the laparoscopy and colonoscopy. So, that’s how I’m building my own rehabilitation course. Have you been on a rehabilitation course? What was it like? Could you design your own? Have I missed something important in the one I’m designing? After my hysterectomy, I was so happy to be able to get off Visanne after a year of being on it. Although the side effects didn’t seem to be too severe, one of them was – the acne. I was covered in cysts and oily bumps from the top of my head, sometimes down to my waist. It waxed and waned – two weeks of extremely severe acne, followed by two weeks of slow healing (fibromyalgia seems to slow the healing process). Some cysts never disappeared completely. I got comments from family that I looked like had some dreadful contagious skin disease. Pointing fingers from young kids asking their parents what was on my face. 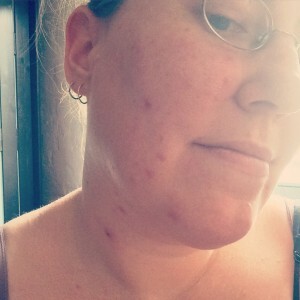 Such severe acne is depressing, shaming, isolating. In the two months after my operation, my skin cleared completely. Only a low level of blackheads and the occasional small pimple remained. Better than in all of the 25+ years I had been on birth control, trying to control the endometriosis and pain. When I finally got my lab results from the hysterectomy, I knew I’d have to go back on Visanne, and stay on it. They had taken biopsies during the laparoscopic hysterectomy from places that had seemed clear to the camera. Under a microscope, they weren’t – endometriosis cells were found throughout. At my second checkup with the gynecologist after the operation, I was told I’d have to stay on Visanne, at least until menopause, or else the endometriosis would quickly regrow. Again. I don’t want that. I don’t want a seventh laparoscopy. Plus the surgeons here in Germany told me they wouldn’t do yet another laparoscopy within 10 years of my hysterectomy, because I’ve had too many laparoscopies and colonoscopies. And with every operation, the risks, the impact and the required healing time increase. A little in the first month, and then in the second month, in full force – families of cysts, from head to hip. It comes and goes in that familiar cycle – two weeks of cysts, two weeks of healing. I haven’t yet found anything to reduce or stop the Visanne acne. My skin is sensitive, easily develops rashes and eczema, is allergic to erythromycin, badly sensitive to salicylic acid, and likes to peel. So I’ve been sticking with mild cleansers, tea tree oil for drying out spots and preventing infection, and a skin healing oil mixture that I discovered when I had extreme urticaria for a year. The other listed side effects of Visanne: breast discomfort, decreased mood and libido, sleep problems, headaches and migraines, irritability and nervousness, nausea, weakness and weight gain. I had all of these when not taking the medication, and can’t clearly gauge how much it has contributed. Breast soreness, enlarging and migraines have always been cyclical with my period and generally severe. Sleep problems, depression and libido problems can come from fibromyalgia and PTSD. Weight gain and nausea from the fibromyalgia medication and generally being in chronic pain. And I have two other headache contributors – regular sinusitis and a cervical spine problem. I’ll keep searching for ways to reduce the acne, but I’ll stay on Visanne. This oil can be used to help repair skin and reduce itching. I typically rub a few drops lightly over my face and neck before bed after washing – the lavender and chamomile scents also help with sleep problems. When I had urticaria (hives), I’d put about 20 or more drops into a bath with a bag of oats to soothe the itchiness, and use the oat bag to very gently rub the surface oil over my skin. It also makes a great nail oil! tea tree – antiseptic, anti-acne, but I hate the smell! What side effects do you get? Have you managed to control the acne, if you get it? Please share your experiences or questions in the comments below! In my case, the answer is yes, without fail. And quickly too. In most cases, the answer is also yes. How quickly endometriosis cells grow is different for everyone. Some never have problems again after an operation, having a child or entering menopause. Some must stay on synthetic hormones to suppress the endometriosis. Some have to undergo regular operations, cutting away more and more. Endometriosis cells are too small to see with a naked eye, or even a magnifying camera in your belly during a laparoscopy. It’s no wonder that some cells are missed. Of course, the larger visible growths can be cut away. And this usually resolves a lot of the pain and infertility issues that led to the laparoscopy. But the tiny, unseen deposits of endometrial cells usually remain. That’s why it’s important that samples are taken from the ‘good’ sections of the pelvic walls and organs. If the laboratory finds there are endometriosis cells in many of these samples, you can take a medication to slow their growths, or try to shrink them away. Too many people are surprised that even after six laparoscopies, with the surgical removal of endometriosis growths and adhesions each time, three chemically-induced menopauses, and now a total hysterectomy, I still have endometriosis. Samples taken from various healthy-looking locations inside my pelvis contained these ‘bad’ cells. Had the lab not tested, I would have stayed off medication – the side effects of constant dienogest (progestin) are not pleasant. But now, I’ll be on Visanne until menopause, attempting to slow the regrowth somewhat, seeing as they don’t want me to have another operation for endometriosis for a decade (I’ve had too many already). Normally, there is the option of using Lupron or Zoladex to actively shrink the growths. This works well for many people. Unfortunately, I’ve already had 3 courses, and must now look after my lower-than-normal bone density. My endometriosis will never be fully cured, at least not with the current medication options. Endometriosis doesn’t go away if you ignore it, even after laparoscopic excision, pregnancy or even menopause (chemical or natural), those cells remain. There is a big misconception that having a child is a ‘cure’ for endometriosis. It’s not. The endometriosis cells remain, dormant during pregnancy due to the nine months of hormonal changes, but still there. Menopause is also not a cure. Sure, estrogen is reduced as the ovaries shut down. But estrogen is also produced in adipose (fatty) tissue, and many women take estrogen (HRT) tablets to make menopause symptoms milder. Endometriosis lesions feed on estrogen, and continue to grow, albeit slower when less estrogen is available. Sadly, we can’t avoid estrogen. Phytoestrogen naturally occurs in plants and mushrooms. We are constantly exposed to synthetic xenoestrogens in plastics – water bottles, BPA plastics, plastic wrap and plastic containers. Parabens and phthalates in cosmetics and lotions are xenoestrogens. Pesticides and herbicides contain xenoestrogens (atrazine, DDT, endosulfan). Zeranol, a growth-stimulating xenoestrogen, is given to livestock (US and Canada). The xenoestrogens in the runoff from waste-water treatment and paper wood-pulp bleaching accumulate in fish and wildlife. As we can’t avoid estrogen, the endometriosis cells can never shut down. Then what can be done against endometriosis? The best option is to catch endometriosis early. Limit the spread of the cells and the damage. Don’t put off having an operation because “it might just clear up by itself”. Cut out the endometriosis deposits and the tissue surrounding them (don’t burn them – that just spreads the cells around). Reduce the growth-rate of cells with endometriosis medications (Visanne, Lupron, Zoladex) and/or with pregnancy and menopause, and by avoiding exposure to xenoestrogens. Don’t tell young girls that period pain or heavy bleeding is ‘normal’. Never tell any woman that they are faking the pain, and just seeking attention. Just because you can’t see endometriosis on the outside, doesn’t mean it isn’t real. It’s debilitating and disabling. If you ignore endometriosis, it will make you pay, for the rest of your life.